How to live the good life in East Lane County. Moments in the wilderness can be really wild — biking through muddy singletrack, hiking up remote trails and eating all the dried fruit and nuts that spilled in your pack. But life in the wilderness can also be elegant, filled with lavish dinners, wine tastings, cozy B&Bs and soaks in tiled hot spring pools. Out here in east Lane County, you can have it all. Rustic and refined. Adrenaline-pumping and relaxed. You just need to know where to start. Fortunately we have just the itinerary for you — one that lets you sit back and enjoy the ride. Take a plane, train or automobile (or the Willamette Valley Scenic Bikeway) to the Emerald City, Eugene, where you’ll find a symbiotic blend of counter-culture heritage and lively collegiate sports and academics. Don’t be surprised by strangers striking up conversation or smiles at every corner. Really, that might happen, especially if you’re wearing tie dye or a University of Oregon t-shirt. 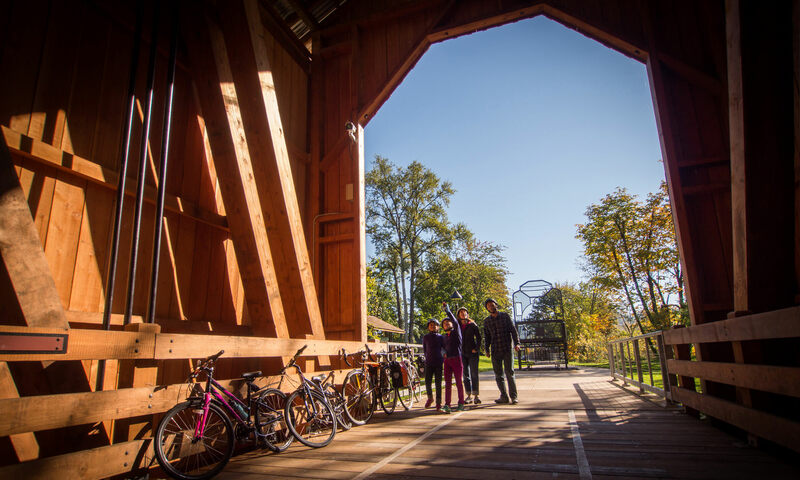 Cyclists love Eugene for its easy-to-navigate bikeways and car-free paths, like the super scenic Willamette River bike trail. Bike services and rentals are offered at a dozen companies across town. Many hotels welcome bikes too, like the Inn at the 5th, Hilton Eugene, Phoenix Inn Suites, Courtesy Inn and Valley River Inn. It’s not a trip to Eugene without visiting the buttes. 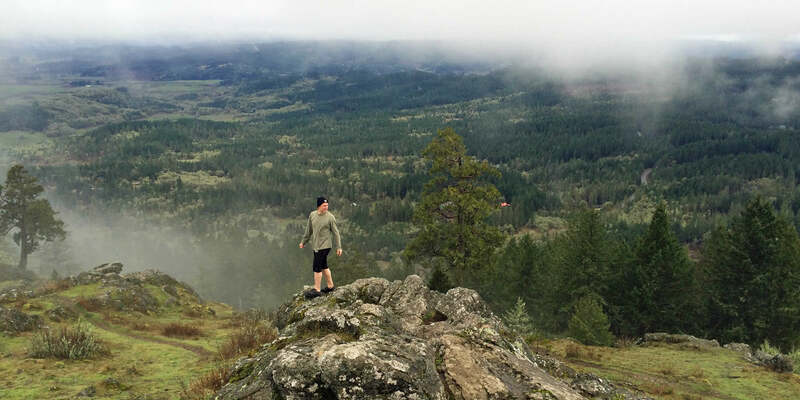 At the top of Skinner’s Butte, easy to access by bike or car, take in a treetop view of the city. On your way down, look for rock climbers scaling the columns. To the south of town, at 2,058 feet, Spencer Butte is an invigorating hike well worth the reward of seeing the valley from above the clouds. Hungry? You won’t be for long. Eugene boasts a wide selection of lip-smacking stops. Bike-friendly favorites include Mezza Luna Pizzeria, Morning Glory Café and Off the Waffle. 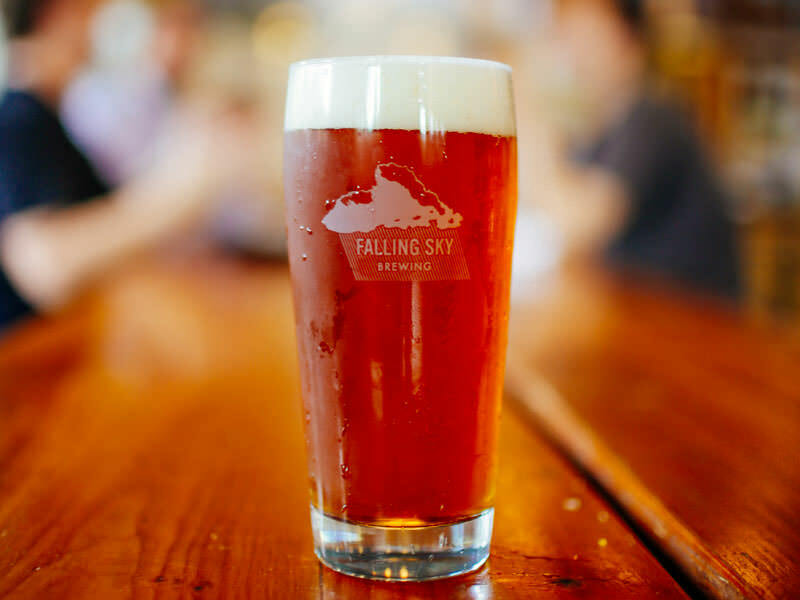 Be sure to stop by the Whiteaker neighborhood, a craft brewery hotspot, with Ninkasi, Oakshire and Falling Sky all worthy of a cheers or two or three. (After all, they’re all stops on the Eugene Ale Trail.) Do yourself a favor and stock up on desserts at Sweet Life Patisserie for now and later. You’ll also get your fill for culture in Eugene. The Hult Center for the Performing Arts hosts a variety of shows year-round, like the famous Oregon Bach Festival, whereas the Cuthbert Amphitheater comes alive in the summer and the one-of-a-kind Eugene Saturday Market runs spring through Christmas. No matter the season, feel free to get lost in the University of Oregon’s two extensive museums: the Jordan Schnitzer Museum of Art and the Museum of Natural & Cultural History. 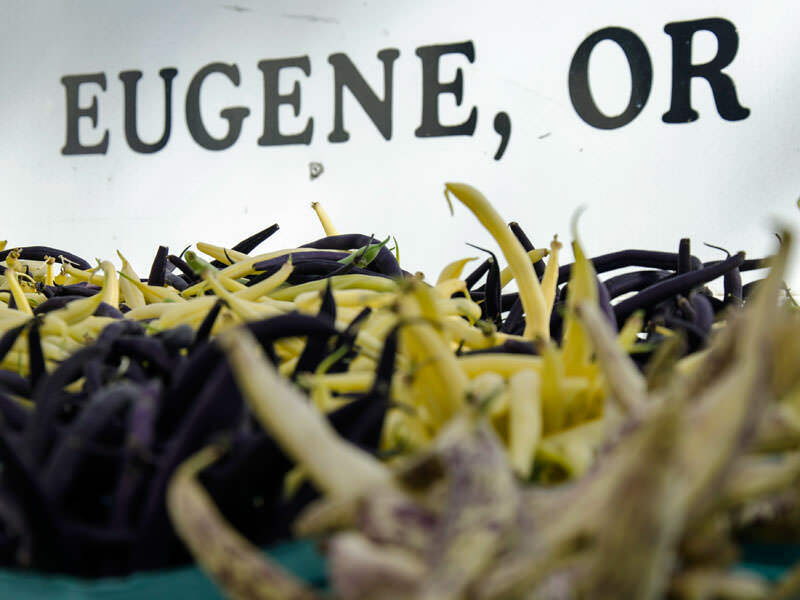 It’s also a good idea to visit the towns north of Eugene, each ripe for exploring. In Coburg, step back in time among 19th-century architecture and antique stores — where you should eat multiple meals at The Coburg Inn, located in the historic Van Duyn House, boasting two western-themed eateries. Nearby Junction City is perhaps best known for its annual Scandinavian Festival and six spectacular boutique wineries. For helpful travel tips and suggestions, visit the Eugene, Cascades & Coast Adventure Center in Springfield. Eugene and Springfield are so close in proximity that you might not always realize when you’ve crossed the boundary from one tree-lined city into another. And it’s not just residents reaping the rewards of this cultural collision. Visitors can easily combine the attractions of Eugene and Springfield — and the rest of Lane County for that matter — into one fantastic trip. Kids can take the wheel (okay, not literally) and pick the stops. At the edge of Eugene, Roaring Rapids Pizza Company has more than great pies; it also boasts riverfront dining, an indoor 1930’s carousel and the piano-playing mechanical mascot, Brownie the Bear. Next door at Camp Putt Adventure Golf, take a swing at the two 18-hole miniature golf courses, complete with scenic waterfalls and creeks. Down the road, Dorris Ranch Living History Farm offers interactive tours at the nation’s oldest commercial filbert (hazelnut, to non-Oregonians) orchard still in continuous operation, open 7 days a week. Bring swimsuits and smiles for Splash! 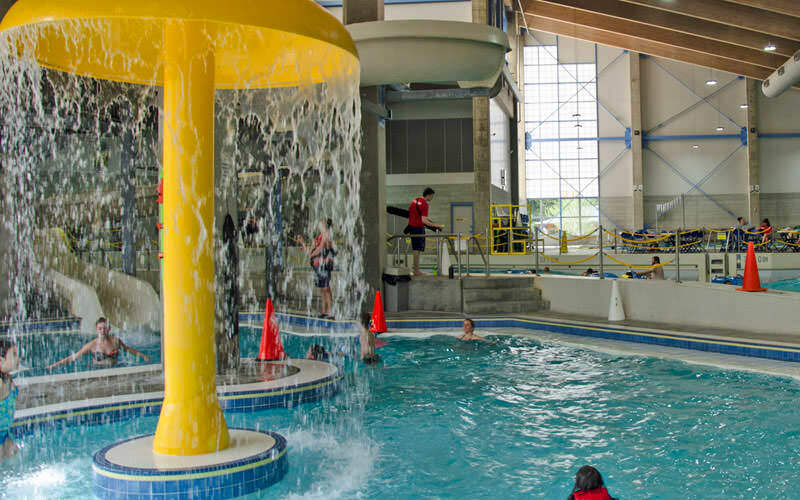 at Lively Park, a year-round indoor water park featuring a wave pool, slide, kiddie pool, spa and giggles galore. All the excitement can work up an appetite. It’s time to let the parents pick the place. Besides having great grub (and beer), Plank Town Brewing is located in the heart of downtown Springfield, where you can have a scavenger hunt for the city’s creative murals, including one of the famous Simpsons clan. Another special spot for libations, Claim 52 Brewing – The Abbey, shares space in Sprout! Regional Food Hub, located in a restored church. Food and beer or cider pairings are available through the Sprout! kitchen and marketplace, including 100 Mile Bakery, specializing in breads and sweets made with locally sourced ingredients. 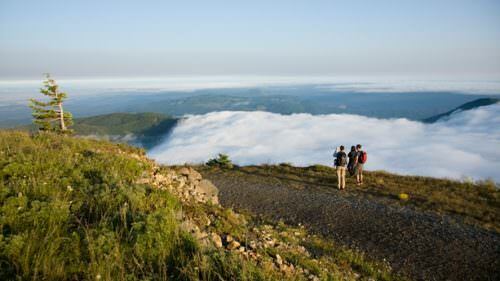 Elevate your experience with a hike at Mt. Pisgah for a bird’s-eye view of the valley, that is after you get distracted by the arboretum’s wildflower meadows, oak savannas and water garden. Fall brings mycologists to Pisgah for the famous Mushroom Festival. In the summer, pick an aromatic bouquet at McKenzie River Lavender, 10 miles east of Springfield, during the farm’s annual festival. Or for a wet and wild adventure, join a rafting or fishing trip on the McKenzie River with A. Helfrich Outfitter, with transportation from Springfield available. The glacier-fed waters of the McKenzie River are so clear, so sparkling that it can be hard to look away. And there are no shortage of great viewpoints. Near Vida, the well-photographed Goodpasture Covered Bridge, built in 1938, stretches over the McKenzie in classic Americana style; but at night the iconic white walls get a modern twist, illuminated in bright lights. Down the highway near Rainbow, the Belknap Covered Bridge is also worth the photos, especially from the louvered arch windows that overlook passing drift boats. In between the bridges is a worthwhile detour to the Terwilliger Hot Springs (also known as Cougar Hot Springs). A short hike from the trailhead leads to the six steaming pools, ranging from 85 to 112 degrees Fahrenheit, in a shaded forest setting. If clothing-optional bedrock pools sound a little too rustic, Belknap Hot Springs is a stylish alternative, with two tiled pools set at a plush resort and acres of gardens. 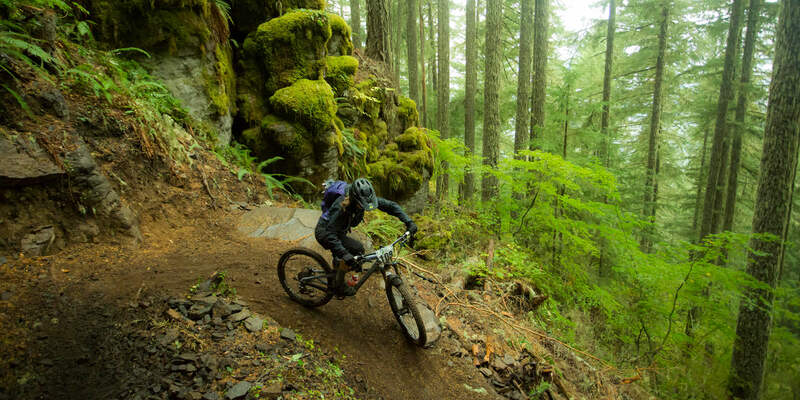 Mountain bikers give plenty of praise to the world-famous McKenzie River Trail, but the recently reopened O’Leary Trail Loop is getting some rightful attention too. The backcountry track is challenging with tight switchbacks and big climbs. Riders get major bragging rights. 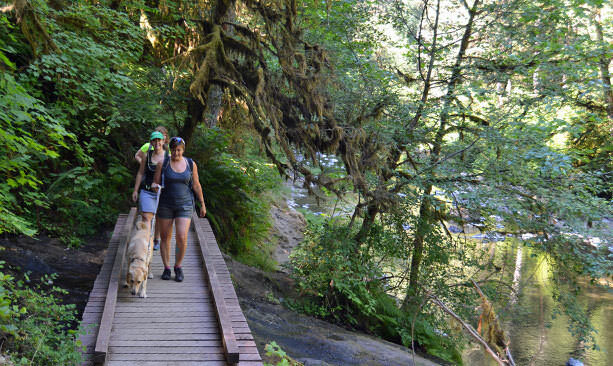 The western end of the 26-mile McKenzie River Trail begins near the town of McKenzie Bridge and winds along the river until its headwaters at Clear Lake. 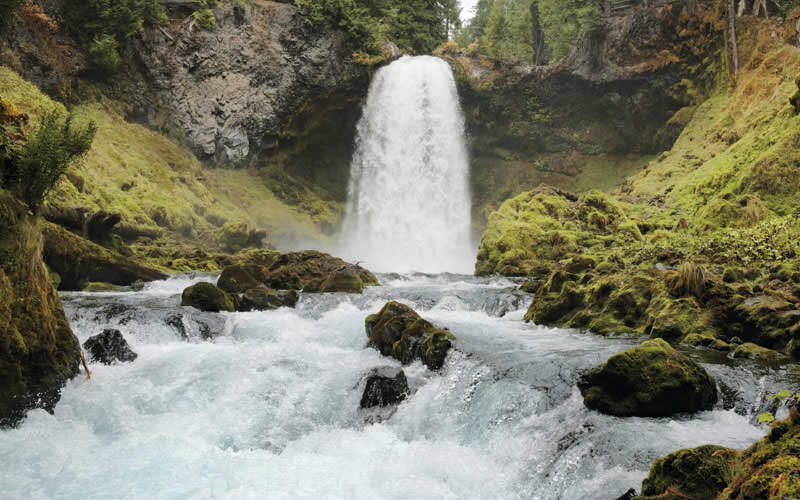 Though it’s best known as a mountain bike trail — once named America’s #1 bike trail by Bike Magazine — hikers can also enjoy the picturesque route that winds by some of the area’s best natural attractions, such as Tamolitch Pool and Koosah and Sahalie falls. Shuttle services Cog Wild and Cascade Bike Tours take the worry out of getting to and from the trails. And if your mountain bike game is rusty, Mountain Crossing MTB Services can teach you how to become a better rider. 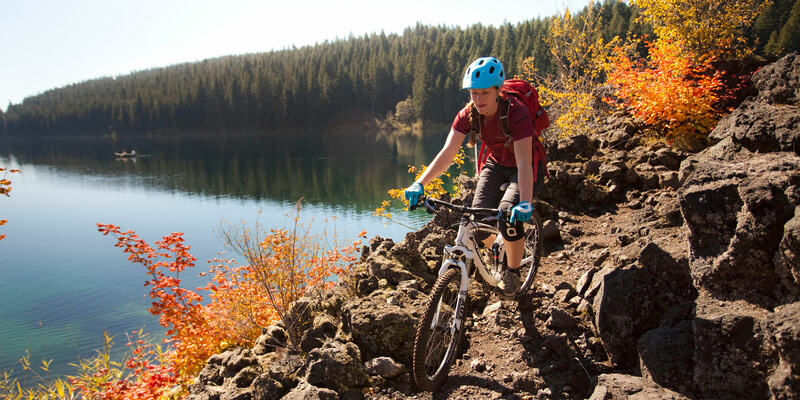 McKenzie River Mountain Resort also organizes intermediate to advanced mountain bike tours. Experienced road riders love the McKenzie Pass Scenic Bikeway the most during a few weeks in spring when a skinny lane in plowed through the snow and the highway is open only for non-motorized travel. If riding 38 miles at 2,366 feet through a snow zone sounds fun, it’s definitely worth the trip. To really experience the McKenzie’s glory, consider taking a guided rafting or fishing trip. In the summer, outfitters like Horse Creek Lodge organize custom half- and full-day whitewater rafting adventures down the most exciting miles of the river. Best of all, they equip guests with everything from flotation devices and wet suits to snacks. The righteous rapids attract another exciting escapade: drift boat fishing. Guides maneuver special-made McKenzie River dories — with flat bottoms, flared sides, narrow bow and pointed stern — down the fast-flowing courses as fly-fishing passengers lure hungry trout. Water reigns supreme around the McKenzie. Proxy Falls features two cascades simultaneously spilling down mossy walls into the porous lava rock on the ground. Since the trail is located off Highway 242, which closes in winter, Proxy Falls is a go-to waterfall destination from June to October. Off the McKenzie River Trail, Tamolitch, the Blue Pool amazes hikers with its otherworldly cerulean waters. Because Tamolitch is such a popular destination, we should take extra care by leaving no trace and avoiding peak times. It’s also important to stay out of the pool’s very chilly waters, which are still dangerously cold even in the summer. The Waterfalls Loop Trail, part of the McKenzie River Trail, weaves a short distance through old-growth conifer forest before reaching the impressive Koosah and Sahalie falls. Each falls has its own viewpoint and interpretive panel. Plus they’re easy to access from parking areas so you really have no excuse to miss these jaw-dropping cascades. Rest your head at one of the many picturesque lodging options. There’s no shortage of charm in the southernmost part of the Willamette Valley. Loop back through the Eugene-Springfield metro and head south to the idyllic farm landscapes, wineries and covered bridges of Creswell and Cottage Grove. Along the way, we don’t blame you for stopping by the trio of wineries on Territorial Highway — Iris Vineyards, Sweet Cheeks Winery & Vineyard and Silvan Ridge Winery — just please make sure the designated driver uses the spittoon. Veneta is also an easy detour here, whether you’re looking for the Coyote Creek Covered Bridge, a meal at Our Daily Bread Restaurant or a wildlife-viewing paddle along Fern Ridge, the largest reservoir in the southern Willamette Valley. If the crew is itching to hit a rustic mountain bike trail, consider the Carpenter Bypass Trail Network, also known as Whypass. Formerly an unsanctioned trail network, Whypass now boast 20 miles of gravity-flow singletrack managed by the BLM. The runs and jumps range from intermediate to expert. After those well-deserved detours, make your way to Creswell, a friendly community with its own municipal airport. Golfers recognize it as the home of Emerald Valley Golf & Resort, which has hosted multiple U.S. Open and U.S. Amateur qualifier tournaments as well as the University of Oregon golf team. 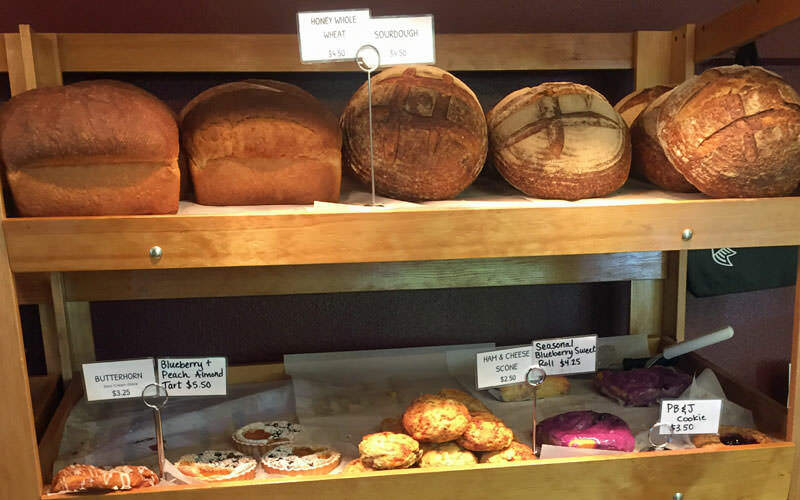 Follow the aromas of scratch-made breads wafting from Creswell Bakery, noted for using fresh, local ingredients in everything from pastries to the meat in sandwiches. It’s easy to see why the farm-to-table movement has momentum in Creswell. Catch the Creswell Farmers Market from late May through October, and stay tuned for the upcoming seasons of My Brothers’ Farm, which will produce sustainable cider apples, hazelnuts, bison and heritage pigs. For more visitor information, contact the Creswell Chamber of Commerce. On the way to Cottage Grove from Creswell, Saginaw Vineyard specializes in a variety of fruity wines infused with blackberries, raspberries and cherries. (Buy a bottle for the driver to enjoy later.) For a more scenic ride, take Davidson Road south. Cottage Grove is called the covered bridge capital of the West, boasting the most of any town in Oregon. It’s also twice received the All-American City Award — which should paint a good picture of how utterly charming Cottage Grove is. 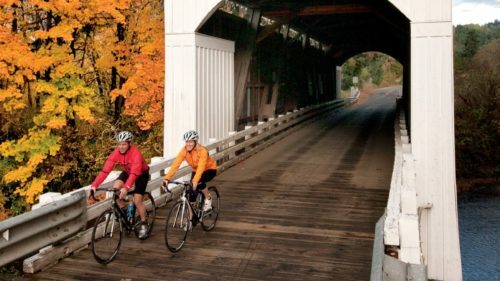 The city’s quintessential experience is the Covered Bridges Scenic Bikeway (part of the Cottage Grove Covered Bridge Tour Route), which weaves 36 miles from the historic downtown, though six covered bridges — Chambers, Centennial, Mosby Creek, Stewart, Dorena and Currin — to the beautiful Dorena Lake. For bike service and rentals, talk to the experts at Rainy Peak Bicycles in downtown Cottage Grove. Gardeners and botanists appreciate the large selection of uncommon flora at Log House Plants near Dorena Lake. The 40-year-old establishment specializes in organic heritage plants, hybrids, edible flowers and grafted vegetables. Green thumb or not, there’s enough breakthrough botany to amuse everyone. Fill up on local fare at Jack Sprats, Buster’s Main Street Cafe, Urban Kitchen and more, then relax at Village Green Resort‘s cozy rooms and 14 acres of gardens or with front-row seats to Dorena Lake and mountain views at Lily of the Field B&B. The trip caps off at the outdoor playground of the southern Willamette National Forest, where one could argue there are more trailheads than people. A cluster of Oregon State Parks are found northeast of Creswell along Highway 58: Jasper State Recreation Site, Elijah Bristow State Park and Willamette River Greenway offer canoe and kayak launch points to the Willamette River Water Trail; while Lowell State Recreation Site is a picturesque park at Dexter Lake with a marina and seasonal rowing and drag boat races. More lakeside fun awaits at nearby Fall Creek State Recreation Area, featuring 39 first-come, first-served campsites in the summer. The 13.7-mile Fall Creek National Recreation Trail is a special hiker-only route boasting scenic views, log footbridges, a shallow cave, a double waterfall and secret spots to find fall mushrooms and riverbank agates. Around Lowell, add three more covered bridges to your list: Pengra, Unity Bridge, Cannon Street, Lowell and Parvin. At the town’s namesake bridge, the widest covered bridge in Oregon, a detailed interpretive center describes the five landmarks as well as the state history of covered bridges. Ready to mountain bike? Warm up with the North Shore Trail at Lookout Point Reservoir, a scenic out-and-back route without no major climbs. Then it’s time to dig into the main course, Oakridge, an official gold-level International Mountain Bicycling Association Ride Center. It’s no wonder why this former logging town is called the mountain biking capital of the Northwest. Every year, Oakridge plays host to several impressive ride festivals like Mountain Bike Oregon, Cascade Cream Puff and Trans-Cascadia. The Willamette Tier of the new Oregon Timber Trail also rolls through town. But it’s not just pros flocking here. 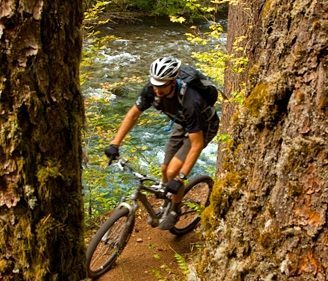 With hundreds of miles of singletrack flowing through the foothills of the Cascade Mountains around Oakridge, there are rides for every skill level — along the river, down mountain ridges and through thick forests. Many of the trails even originate within the city. For more backcountry rides, take advantage of shuttles and tours with Oregon Adventures. The Oakridge-Westfir community has embraced its status as a world-class mountain biking destination. At any given day, you’ll see cyclists and locals chatting a storm at the prized real ale public house, Brewers Union Local 180, testing cocktails together at the tasting room of Deep Woods Distillery or sharing stories while filling stomachs at Cedar Creek Meats & Provisions and Uptown Bistro. Get the inside scoop while you pick up supplies and schedule shuttle service at the Willamette Mountain Mercantile, located in an old-timey Western storefront. There’s more than mountain biking here. The Willamette Fish Hatchery has fish viewing ponds, a museum and even a 9-hole miniature golf course depicting the salmon life cycle. The Office (Westfir) Covered Bridge is bright red and hard to miss, especially during the holidays when it gets decked out in lights. Continue on Highway 58 to find the second-highest single-drop waterfall in Oregon, Salt Creek Falls, and witness its immensity from the wheelchair-accessible observation platform at the top of the falls or from the canyon rim gravel trail. Half a mile away, the Salt Creek Sno-Park offers winter snowshoe access to the falls, plus several miles of exciting cross-country skiing trails. Nearby Diamond Creek Falls awaits on a 3.2-mile loop trail with two tiers of falls — you can even sit at the base of the Upper Falls — and connects to a mountain bike trail. Willamette Pass Ski Area is also just a short distance away, home to alpine skiing and Nordic trails in winter and lift-access mountain cycling in the summer. On the way back to Oakridge, a soak in the rustic McCredie Hot Springs might sound just right. Just remember the pool borders a fast-moving Willamette River tributary and the undeveloped site is clothing-optional. After all the excitement of East Lane County, a night or two (or more) at Oakridge Lodge & Guest House or Westfir Lodge, A Bed and Breakfast Inn, seems due. 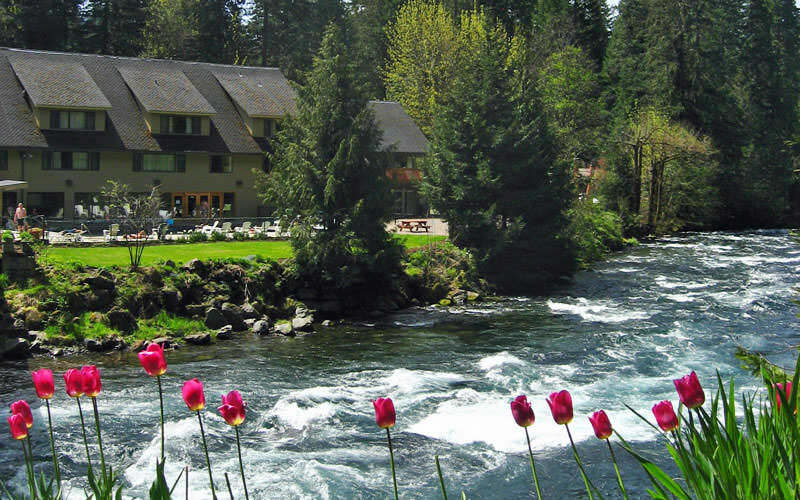 Oakridge Lodge is located in the heart of Oakridge, whereas Westfir Lodge is next to Office Bridge along the North Fork of the Willamette River. Rejuvenate in the classic Oakridge-Westfir experience, where you’re sure to have more than one magical moment in the Cascades. Sachie Yorck is Content Editor at Travel Oregon. Depending on the day, she could be record-hunting in downtown Portland, hiking on a muddy forest path or soaking in one of Oregon's many natural hot springs.